Browse: Home / Brian MacLeod / UMaine Basketball’s Home Court (Dis-)Advantage? UMaine Basketball’s Home Court (Dis-)Advantage? As a native of Bangor, my heart was sad to say goodbye to the legendary Bangor Auditorium when I walked out its doors for the final time this past February. So many of my childhood memories are directly associated with the old arena known simply as “The Mecca”. From my days as a young boy attending the Class B, C & D high school basketball tournaments with my dad, to seeing my very first live WWF event in the 13th row of the bleachers, to my time on the Bangor High School boy’s basketball bench as “head statistician” (thanks for the fancy title, Coach Reed) during their run of back-to-back state championships in the mid ’90s, I can’t imagine growing up without the Auditorium occupying its corner of Buck & Main in Downtown Bangor. My head, however, was excited to see the Auditorium make way for a beautiful new, state-of-the-art arena. The Cross Insurance Center may be the final and most impressive piece of Downtown Bangor’s decade-long revitalization puzzle. 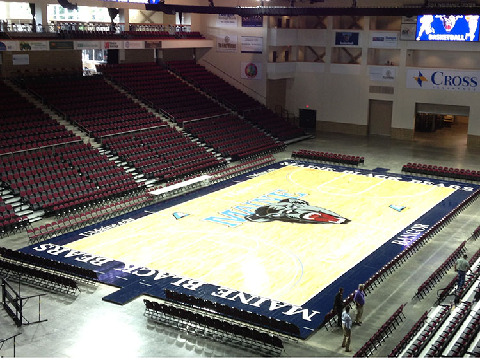 My excitement was soon accompanied by both skepticism and mild confusion when I learned that the University of Maine’s men’s and women’s basketball teams would be playing the majority of their home games at the Cross Center this upcoming season. It seemed silly to me to have the teams play off-campus and out of town when there’s a perfectly good arena on campus to host their home games. The university clearly anticipated such skepticism from their alumni and supporters. Director of Athletics Steve Abbott was quick to point out to the Bangor Daily News in July that the basketball teams have had to play second fiddle to Maine hockey when it comes to practice time at Alfond Arena, which creates less of a home court advantage than one would think they’d have on campus, due to the lack of intimate familiarity with the facility. Abbott went on to say that the university would be committed to creating a real home court college atmosphere in Bangor by bussing students to and from the Cross Center for home games. While that’s all well and good, I’m curious to see if there will be any noticeable impact of the teams both practicing and playing in the same facility. Will field goal and free throw percentages be higher this year because players will be more comfortable with the Cross Center shooter’s eye? How will we be able to prove the arena is the reason why? Additionally, I’ll be interested to see how many on-campus students will take the university up on their offer of a free bus ride to and from Bangor. Will a large enough segment of the student body be willing to sacrifice the additional 45 minutes or so on a bus that they could instead spend studying, sleeping, or just hanging out with friends? With all due respect, Mr. Abbott cannot properly predict the answers to these questions. For those alumni expressing concerns about the cost-effectiveness of this arrangement, which is costing the university a reported $5,500-$7,000 per game, the athletic department disclosed that it was already spending about $3,000 per basketball game to convert the Alfond Arena ice to a hoops hardcourt and that the school would retain all revenue from ticket sales at their new home. UMaine is hoping those ticket sales are higher in Bangor than they were in Orono, contending that alumni, fans, and off-campus students living in and around Bangor will be able to attend games more conveniently at the Cross Center than at Alfond Arena. This part of the university’s argument is also far from a sure thing. Would they make the same argument if it were the hockey team playing their games in Bangor? From my 25+ years attending UMaine hockey games, I’ve seen more than a healthy handful of seats across Alfond filled by people who live in the greater Bangor area, while the majority of seats in the student section are filled by students who live on campus. In general, attendance is a product of performance, not geography. If the basketball teams expect to draw to a level of profitability in Bangor (or anywhere else, for that matter), they will need to put a better product on the court this season than last, when the men’s team finished 11-19 (6-10 in conference) and the women’s team finished 4-24 (3-12 in conference). If the attendance isn’t there, is this still a financially responsible move? I admit to not being smart enough to know the answer to any of these questions. As a Bangor native and UMaine alumnus, I certainly hope it’s a successful venture. While it seems much of the university’s argument hinges more on optimism than fact, nothing successful has ever happened without a positive attitude. I hope the players do find an advantage in being able to play where they practice. I hope this does end up being a financially profitable decision for the athletic department. And I hope that students (both those on- and off-campus), supporters, and alumni do enjoy (or at least don’t mind) the idea of heading to Downtown Bangor for Maine basketball games. Hope can only get me so far on this one, though, for I’ll always be a bit of a skeptic at heart. I’ll need to see it to believe it.